29-11-2016 • Categories: Awards, Clients, News, Search! USG People and Textkernel have won the Recruitment Tech Award 2016, category Best Case. The award was granted at the Recruitment Tech Event in Utrecht on Thursday November 24th. 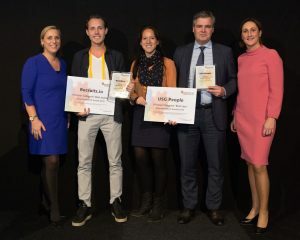 The jury praised the joint case from USG People and Textkernel because of its strong internal component: in order to work cross-brand, a cultural change has to be successfully realised within USG People and all its subsidiaries. Beforehand, all subsidiary companies within USG People worked with separate databases. Since the integration of Textkernel’s technology, every brand within USG People works with one central and easily searchable database. The integration resulted in an efficiency improvement, a significant cost reduction in the use of external databases and better matches between candidates and jobs. Apart from an internal culture change for sharing candidates, the tooling needed to be strongly embedded within all parts of the company. The jury felt that USG People was very successful in accomplishing this. USG People receives more than 50,000 applications a month, which were all stored in the separate databases off the different brands. Because the databases were not easily searchable, only 10% of the candidates could be matched to a job. Textkernel’s CV parsing software Extract! and semantic technology Search! created a joint, semantically searchable database. As a result USG People can now match candidates faster and more efficient, and a significant cost reduction was made. With brands as Start People and Unique and a yearly revenue of 2.6 billion euro, USG People is one of the largest HR-services providers in Europe. Via USG People over 100,000 people are working for 15,000 clients. Textkernel specialises in semantic recruitment technology offering multilingual CV parsing, job parsing and semantic search, sourcing and matching software. These tools, easily integrated into existing systems, help accelerate the process of matching people and jobs.